Identity Provider can be used to grant external user identities permissions to AWS resources without having to be created within your AWS account. External user identities can be authenticated either through the organization’s authentication system or through a well-know identity provider such as login with Amazon, Google etc. To use an IdP, you create an IAM identity provider entity to establish a trust relationship between your AWS account and the IdP. Create an Identity Provider entity for OIDC compatible IdP in IAM. Application then makes an unsigned call to the STS service with the AssumeRoleWithWebIdentity action to request temporary security credentials. Application passes the IdP’s authentication token along with the Amazon Resource Name (ARN) for the IAM role created for that IdP. AWS verifies that the token is trusted and valid and if so, returns temporary security credentials (access key, secret access key, session token, expiry time) to the application that have the permissions for the role that you name in the request. STS response also includes metadata about the user from the IdP, such as the unique user ID that the IdP associates with the user. User ID information from the identity provider can distinguish users in the app for e.g., objects can be put into S3 folders that include the user ID as prefixes or suffixes. This lets you create access control policies that lock the folder so only the user with that ID can access it. Application can cache the temporary security credentials and refresh them before their expiry accordingly. Temporary credentials, by default, are good for an hour. AWS supports identity federation with SAML 2.0 (Security Assertion Markup Language 2.0), an open standard that many identity providers (IdPs) use. By using SAML, the process of configuring federation with AWS can be simplified by using the IdP’s service instead of writing custom identity proxy code. SAML metadata document includes the issuer name, a creation date, an expiration date, and keys that AWS can use to validate authentication responses (assertions) from your organization. Application then makes an unsigned call to the STS service with the AssumeRoleWithSAML action to request temporary security credentials. AWS verifies that the SAML assertion is trusted and valid and if so, returns temporary security credentials (access key, secret access key, session token, expiry time) to the application that have the permissions for the role named in the request. SAML 2.0 based federation can also be used to grant access to the federated users to the AWS Management console. 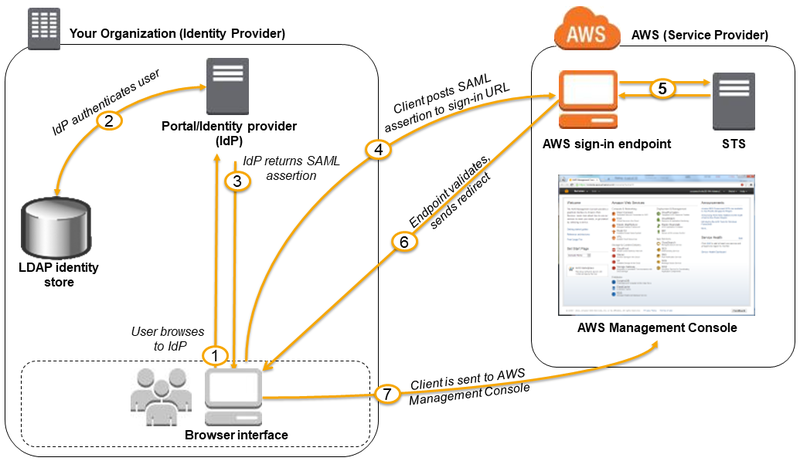 This requires the use of the AWS SSO endpoint instead of directly calling the AssumeRoleWithSAML API. The endpoint calls the API for the user and returns a URL that automatically redirects the user’s browser to the AWS Management Console. User browses to the organization’s portal and selects the option to go to the AWS Management Console. Portal performs the function of the identity provider (IdP) that handles the exchange of trust between the organization and AWS. Portal verifies the user’s identity in the organization. Portal generates a SAML authentication response that includes assertions that identify the user and include attributes about the user. Portal sends this response to the client browser. Client browser is redirected to the AWS SSO endpoint and posts the SAML assertion. 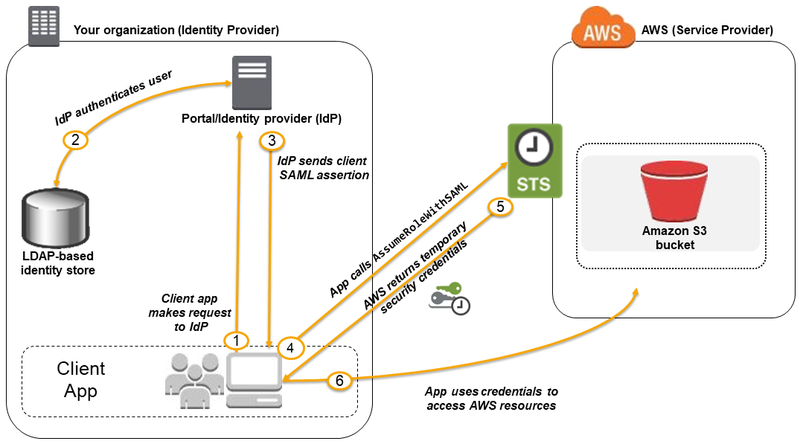 AWS SSO endpoint handles the call for the AssumeRoleWithSAML API action on the user’s behalf and requests temporary security credentials from STS and creates a console sign-in URL that uses those credentials. AWS sends the sign-in URL back to the client as a redirect. Client browser is redirected to the AWS Management Console. If the SAML authentication response includes attributes that map to multiple IAM roles, the user is first prompted to select the role to use for access to the console. Verify that the user is authenticated by the local identity system. Call the AWS Security Token Service (AWS STS) AssumeRole (recommended) or GetFederationToken (by default, has a expiration period of 36 hours) APIs to obtain temporary security credentials for the user. Call an AWS federation endpoint and supply the temporary security credentials to get a sign-in token. Construct a URL for the console that includes the token. URL that the federation endpoint provides is valid for 15 minutes after it is created. Give the URL to the user or invoke the URL on the user’s behalf. Which technique can be used to integrate AWS IAM (Identity and Access Management) with an on-premise LDAP (Lightweight Directory Access Protocol) directory service? Use an IAM policy that references the LDAP account identifiers and the AWS credentials. Use IAM roles to automatically rotate the IAM credentials when LDAP credentials are updated. Use the LDAP credentials to restrict a group of users from launching specific EC2 instance types. Create a set of long-term credentials using AWS Security Token Service with appropriate permissions Store these credentials in the mobile app and use them to access Amazon S3. Record the user’s Information in Amazon RDS and create a role in IAM with appropriate permissions. When the user uses their mobile app create temporary credentials using the AWS Security Token Service ‘AssumeRole’ function. 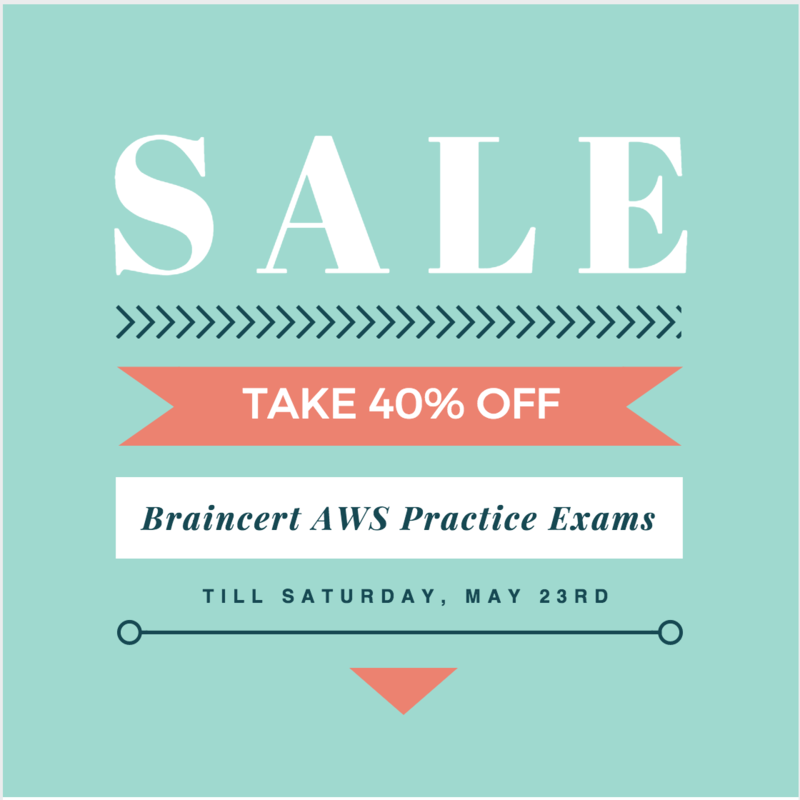 Store these credentials in the mobile app’s memory and use them to access Amazon S3. Generate new credentials the next time the user runs the mobile app. Record the user’s Information in Amazon DynamoDB. When the user uses their mobile app create temporary credentials using AWS Security Token Service with appropriate permissions. Store these credentials in the mobile app’s memory and use them to access Amazon S3 Generate new credentials the next time the user runs the mobile app. Create IAM user. Assign appropriate permissions to the IAM user Generate an access key and secret key for the IAM user, store them in the mobile app and use these credentials to access Amazon S3. Create an IAM user. Update the bucket policy with appropriate permissions for the IAM user Generate an access Key and secret Key for the IAM user, store them In the mobile app and use these credentials to access Amazon S3. Use OAuth 2.0 to retrieve temporary AWS security credentials to enable your NOC members to sign in to the AWS Management Console. Use Web Identity Federation to retrieve AWS temporary security credentials to enable your NOC members to sign in to the AWS Management Console. Use your on-premises SAML 2.O-compliant identity provider (IDP) to grant the NOC members federated access to the AWS Management Console via the AWS single sign-on (SSO) endpoint. Use an EC2 Instance that is launched with an EC2 role providing access to the Score Data DynamoDB table and the GameState S3 bucket that communicates with the mobile app via web services. Use Login with Amazon allowing users to sign in with an Amazon account providing the mobile app with access to the Score Data DynamoDB table and the Game State S3 bucket. Use an IAM user with access credentials assigned a role providing access to the Score Data DynamoDB table and the Game State S3 bucket for distribution with the mobile app. A user has created a mobile application which makes calls to DynamoDB to fetch certain data. The application is using the DynamoDB SDK and root account access/secret access key to connect to DynamoDB from mobile. Which of the below mentioned statements is true with respect to the best practice for security in this scenario? 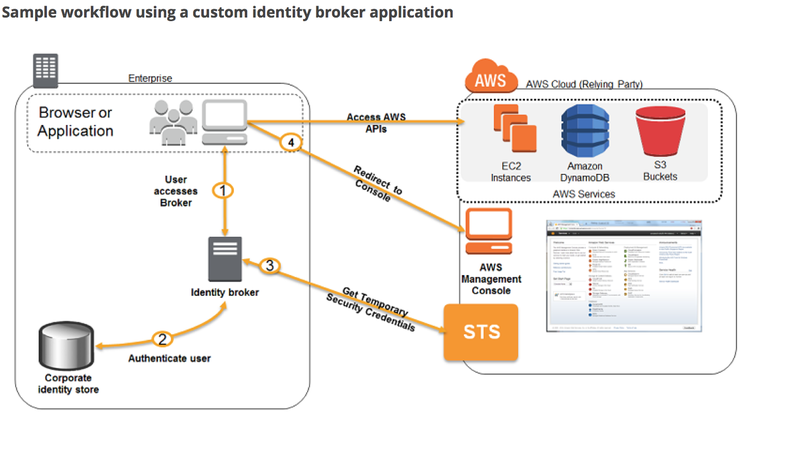 Use of an identity provider like Google or Facebook to become an AWS IAM User. Use of an identity provider like Google or Facebook to exchange for temporary AWS security credentials. Use of AWS IAM User tokens to log in as a Google or Facebook user. Use of AWS STS Tokens to log in as a Google or Facebook user. Games-R-Us is launching a new game app for mobile devices. Users will log into the game using their existing Facebook account and the game will record player data and scoring information directly to a DynamoDB table. What is the most secure approach for signing requests to the DynamoDB API? Use JWT or SAML compliant systems to build authorization policies. Users log in with a username and password, and are given a token they can use indefinitely to make calls against the photo infrastructure. Use AWS API Gateway with a constantly rotating API Key to allow access from the client-side. Construct a custom build of the SDK and include S3 access in it. 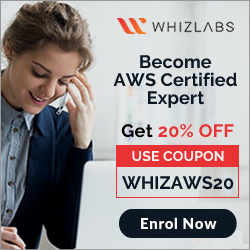 Create an AWS oAuth Service Domain ad grant public signup and access to the domain. During setup, add at least one major social media site as a trusted Identity Provider for users.